There’s nothing better after a long, cold, Iowa winter than to finally be able to bask in the warm spring sun and breathe in the fragrant air. Unless, of course, you are one of the 50 million people in the United States that suffer from allergies. This season is especially tough on sufferers due to the large amounts of pollen plants release. These tiny grains get into the nose, triggering the body’s defense system. As antibodies attack allergens, histamines are released into the blood causing runny noses, itchy eyes, sore throats and other symptoms. But you don’t have to spend the entire season stuck indoors. Instead, try these suggestions to help stay symptom-free. Use an OTC antihistamine. Antihistamines reduce the amount of histamine in your body. They relieve sneezing, itching, a runny nose and watery eyes. Over-the-counter antihistamines include brompheniramine (Dimetane), cetirizine (Zyrtec), chlorpheniramine (Chlor-Trimeton), clemastine (Tavist), diphenhydramine (Benadryl), fexofenadine (Allegra) and loratadine (Alavert, Claritin). Some of the older antihistamines cause drowsiness so don’t drive or operate machinery after taking one. Be sure to read the label. Use a decongestant. Decongestants shrink blood vessels, relieving congestion and swelling. Many times, an OTC allergy medication will combine both an antihistamine and decongestant. Decongestants are also available in nasal sprays and unclog passages faster, without side effects. Common decongestants are oxymetazoline (Afrin, Dristan, Vicks Sinex), phenylephrine (Sudafed PE, Suphedrin PE) and pseudoephedrine (Silfedrine, Sudafed, Suphedrin). Irrigate your nasal passages. Rinsing nasal passages flushes out mucus and pollen. Combine warm water and a little salt and baking soda (about a quarter teaspoon each) to clear the sinus passages. A squeeze bottle or neti pot gets the job done. Use distilled, sterile (previously boiled and cooled) or filtered water to rinse your sinuses. Reduce allergens inside your home. If you do have to be outside when pollen counts are high, change clothes and shower as soon as you come inside. Vacuum often, at least once a week, with a machine that has a HEPA filter. Replace your furnace filter at the start of each season and consider purchasing a HEPA air filter for your bedroom. Wash your bedding at least once a week in the hottest water recommended by the manufacturer. See your doctor. If these at-home options aren’t providing relief, you may need to see your doctor. He or she may prescribe prescription antihistamines and/or decongestants or even suggest trying immunotherapy or allergy shots. Your doctor may also recommend skin or blood tests to find out what allergens trigger your symptoms. 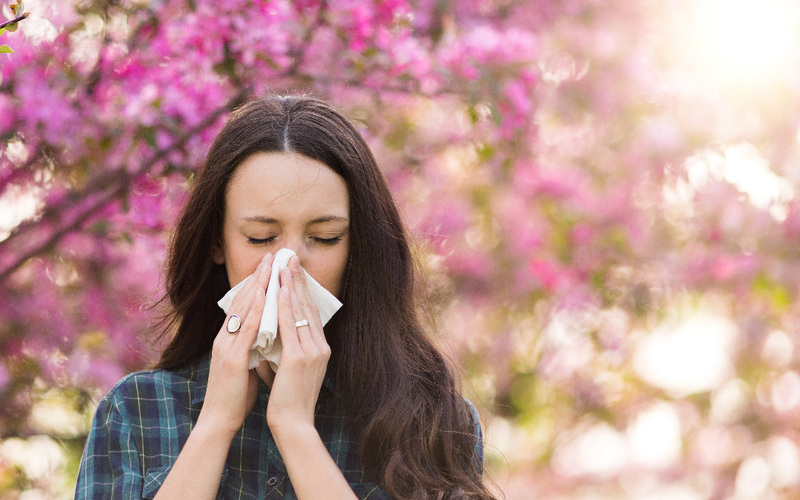 Don’t let spring allergies stop you from smelling the roses – and every other plant that’s currently growing. Make an appointment at one of our locations today to get some professional advice to find relief.